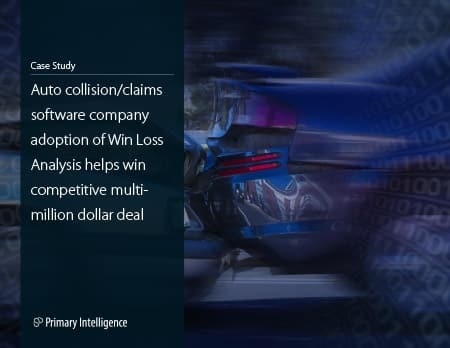 An auto collision/claims software company was looking for a solution that would enable them to win more deals and increase revenue. The company selected Primary Intelligence to improve the sales processes needed to close more sales opportunities through a comprehensive win loss analysis program. When the company first embarked on a win loss analysis program, its senior vice president of casualty sales was apprehensive about the program’s sustainability and the sales team’s receptiveness. Once the company was fully engaged in the program, the SVP, the executive team, and key stakeholders including the sales reps, realized the ongoing benefits of customer feedback, buyer intelligence, and discovery sessions. The sales team now embraces the insights and has improved their sales game including winning a highly competitive multi-million dollar deal they had lost on every previous attempt to win the business. The SVP has now embraced Win Loss Analysis as the keystone to sales enablement, brand messaging, and revenue increase. Download a free PDF of this case study. Previous experience with Win Loss Analysis caused doubts—Win Loss is not about punishing sales! At the company, he realized the brand was strong, but he did not understand why they did not have more brand equity in their market space. Additionally, his reps were very good at building strong relationships, yet he had no insights into why he was still losing some of those deals. Before he first engaged Primary Intelligence, the SVP was skeptical about a win loss program being sustainable. At the time, the software company was experiencing a trend where they lost deals even though they were certain the sales presentation went smoothly and the solution fully matched the prospect’s business needs. He reflected on the win loss program from 20 years prior where there had been some successes, and decided to deploy a program to better understand their brand’s position in the market, gain insights into why they were winning and losing deals, and help shape the direction of sales. Many members of the sales team began to see success as a result of the win loss program. However, there were quite a few sales people who were still tepid about win loss. Upon introducing the program, the SVP realized that proper planning, gaining stakeholder buy-in, and delivering consistent insights to the sales reps would be critical to the success of the program and would need to be a constant priority. During the introductory meeting with the sales team, he asked numerous questions as to why they were winning and losing opportunities. He divided the deals from the previous 18 months into three groups: winning deals, losing deals, and the most valuable deals they needed to win. His most important question to the team: why are we not winning more? The answers were mixed, but none were based upon insights or real buyer data. They were opinions. The SVP shared his first experience with win loss and told the team that the company would be implementing a win loss analysis program with Primary Intelligence. The sales team’s initial response? “They (prospects) are never going to talk to us. They’re not going to tell us what we need to know.” He quickly realized his first priority was to convince the team to buy-in to the program. The SVP constantly reminded the sales team and the organization that winning a deal is not just about a salesperson signing a contract. Winning deals also requires the inclusion of legal, product management, product development, and implementation. He said, “It’s everyone working together to address and build that confidence within the customer or prospect to choose us.” He emphasized to the team that the more they understand the prospect/customer, the more successful they’ll become. The software company held a discovery session (post-sales debrief) with all key stakeholders and their Primary Intelligence team where they gathered strategic insights around a highly competitive and elusive multi-million dollar opportunity they had lost every time they had pitched to the prospect. During the next sales huddle, he informed his team that insights from the discovery session led him to believe they could win this account if given the opportunity. The SVP worked with his sales reps to formulate an action plan based upon the insight from the discovery session to revive the conversation with that prospect. The company took the intelligence gained from win loss analysis and aligned their approach more closely to the buyer’s expectations. As a result they were finally able to win this coveted account. Once the Primary Intelligence Win Loss program was fully engaged, buyer feedback revealed the sales team needed to simplify and shorten the presentation and instead spend more time delving into the buyer’s needs. The first step was to share this feedback with every key player. Once the teams detached emotion from fact, they could uncover trends and develop sales strategies that led to winning more deals. After a few months of conducting the win loss program, Primary Intelligence began diving deeper into the quantitative and qualitative data. Through this, the company recognized the need for process changes and better collaboration. He shared, “The turning point for our team was when we heard numerous times that we are too complicated and our approach was confusing for the buyer.” The software company had to simplify and align their process and messaging if they were going to stay competitive. The company has made discovery sessions a priority and the key players now participate actively. Additionally, they eagerly use the insights to improve and refine core processes to align with buyer needs and expectations. News spread internally about the mega deal, and the sales reps began to understand the power and potential of a properly executed win loss program. They now utilize win loss as an integral part of their sales toolkit to help them win more deals.